The pick-up at your Hotel is early today. 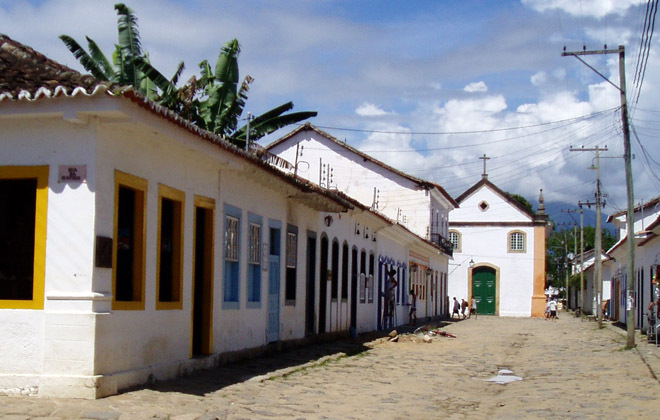 We will drive south along the shoreline of the Green Coast, to the colonial town of Paraty. This 18th century seaport, surrounded by Atlantic mountain rainforest, played an important role during the colonial period when gold from the mines in Minas Gerais was shipped out from here to homeland Portugal, at that time an important colonial power that reigned Brazil during four centuries. The colonial gem is one of the most harmonic architectural ensembles in Brazil and has been named World Heritage by UNESCO. The +4 hours scenic drive along the coast offers great views on islands and hidden beaches of overwhelming natural beauty. Arriving at the village of Patrimonio we will leave the car and proceed on foot through the lush Atlantic coastal rainforest on an old Indian trail rainforest, which leads to the Araponga village of the Guaraní tribe. The tribe has migrated In the sixties from the Paraguayan / Brazilian borderland near Iguaçu Falls (refer to the movie “The Mission”) to several regions in the southeast. 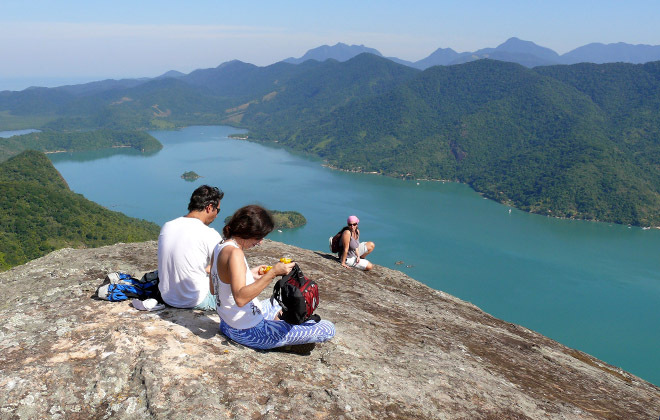 There will be a meeting with the chief and members of the council, presentations of traditional events, an authentic lunch and a hike to a nearby waterfall for a refreshing bath, will certainly contribute to enrich the Paraty experience. We recommend purchasing some of their lovely handicraft, made from natural fibers and wood. This visit is subject to permission from FUNAI – the National Indian Foundation and has been made possible in cooperation with the NGO Nhendeva. Hiking back to the village we take the car again for a remaining short ride to Paraty. A charming Pousada, located in the historic center of the town, awaits the group for check-in. After relax, and a shower, we are ready for dining out in one of Paraty's fine restaurants. Having enjoyed the opulent breakfast at the Pousada, we stroll through this charming seaport town, visiting architectonic gems from Brazil's colonial époque, its mansions und churches from the late 17th and early 18th century. A qualified local guide ensures the superior cultural level of these visits. As a sharp contrast, we will now board our schooner for a 4 hours ride off the coast, taking us into a world of tropical islands and beaches of breathtaking beauty. While anchoring on pristine beaches, nobody resists a swim in the crystal clear waters. Upon returning to Paraty we will have the afternoon and the evening at leisure. You may want to check out the many boutiques displaying a wide array of beautiful handicraft and Brazilian styled leisure wear. As another option still is the puppet show of the famous “Teatro Contadores de Histórias”, with openings on the weekends and daily during high season. This morning we take the regular bus to Laranjeiras, from where we hike about two hours through the Atlantic rainforest to a beautiful cove, Brazil’s only fjord called Saco de Mamanguá. We visit a traditional caiçara family, who live on traditional fishing and produces handicraft from the caixeta tree Tabebuia cassinoides. After a presentation featuring the production of such handicraft, delivered by the family members, we will be served a typical lunch based on fish and seafood. From here we take the kayaks for a ride across the fjord to our guesthouse. Depending on how much time is left, we could head straight for the Pico de Mamanguá and hike to the top. Here spectacular views over the whole extension of the fjord can be enjoyed. The kayaks are left behind on the beach from where we proceed to our beach guesthouse Refuge Saco de Mamanguá. The dinner on the terrace is followed by an very interesting account on the protection of local communities from real estate speculation, delivered Paulo Nogara, from the Institute of Interação Ambiental. Overnight. 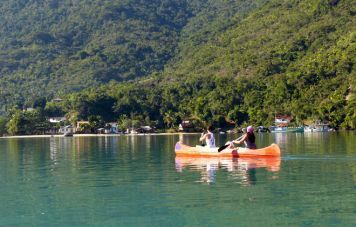 After an early but hefty breakfast we take on the kayaks with destination Parati-Mirim, which is a small beach that served as port to disembark slaves during colonial times, as remains of church and save trading post testify. Including a break at Saco da Velha beach, for swimming, snorkeling and lunch, we will be arriving in Paraty-mirim around 2 pm. 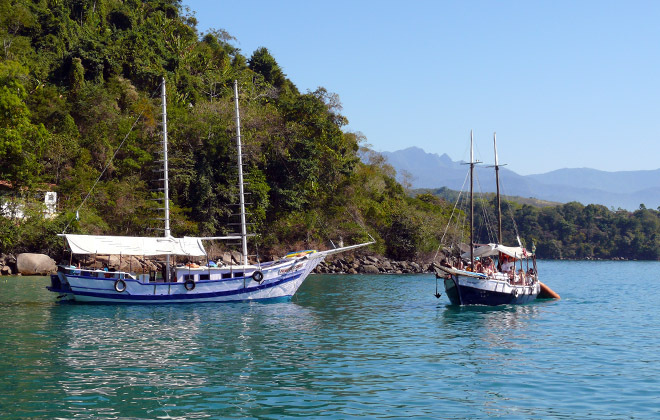 Those who prefer to take the boat to Paraty-Mirim can do so. Again we take a regular bus to bring us back to our Pousada in Paraty. We have arranged a late check-out giving us the chance to take a shower, pack our travel gear and say goodbye to Paraty. There is time to stop however at one of the notorious sugar cane mills that produce fine cachaça, the Brazilian national drink! The cachaça from Paraty has just gained the much desired AOC - Appellation d'Origine Contrôlée classification. We definitely will check whether if it is worth such label. We are specialized in arranging and coordinating environmental surveys for regular schools and sports, health and adventure programs at the Mamanguá bay and Paraty city as well. We invite you to go for a ride, in which you get to know our proposal and demonstrate our experience and background. "We put into practice the pattern of the sustaintable tourism including the local people during the activities, creating gains and increasing the local culture." The Mamanguá refuge is a property which contains three houses of the local style (caiçara style) adjusted for the contemplation of the beautiful view, with wide windows and wooden decks, all located just a few steps from the sea. Sleep and wake up in absolute contact with the nature, observe the canoes and the boats passing by, talk to the kind local people, swim, row, dive, take a walk and sail are some of the options of leisure to whom houses this refuge. In the Mamangua bay there is no power (electrical energy), what increases the feeling of being totally integrated with the effusive nature. Although houses are rustic, they offer lots of comfort due to its equipment: gas fridge, water heaters (showers) and gas lamps. The houses can be rented separately or the whole property. Discover a world of contrast, charming colonial heritage Sites, explore tropical islands by ocean kayak, over night in fishermen villages. Rio's Green Coast is a hidden treasure. It combines dream beaches with tiny fishermen villages and islands, charming colonial Paraty with rainforest and native people. Feel the compelling charm of colonial Paraty strolling through cobble stone alleys, and take a schooner trip to the tropical islands off the Green Coast. For our Brazil Highlights Tour we have chosen four of our favourite parts of the country with the highlights: The tropical metropolis Rio de Janeiro, colonial Paraty, the Amazon rainforest, and beach Paradise and scuba-diving hotspot Arraial do Cabo.